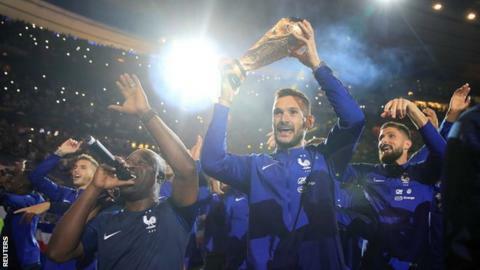 World Cup winners France enjoyed a celebratory homecoming as they paraded their trophy following Nations League victory over the Netherlands. Despite creating little, the visitors – who failed to qualify for Russia 2018 – found a way back through Ryan Babel. However, Olivier Giroud’s smart finish with 16 minutes remaining was enough to hand Les Bleus the points in Group A1. France coach Didier Deschamps named the same team that began the world champions’ goalless draw with Germany in their opening Nations League fixture on Thursday, with only the injured Hugo Lloris absent from the side that started the World Cup final in Russia. The hosts began confidently and were gifted the lead on 14 minutes when Quincy Promes’ poor header evaded his team-mates – instead allowing Juventus midfielder Blaise Matuidi to find the unmarked Mbappe in the six-yard box. Mbappe, scorer of four World Cup goals, almost had his second soon after, narrowly failing to make enough contact with Antoine Griezmann’s free-kick to trouble Netherlands goalkeeper Jasper Cillessen. As the French pressure continued to increase, Cillessen then did well to beat Mbappe to a through ball – and avoid giving away a penalty in the process. The Netherlands had their first real chance on 66 minutes as Georginio Wijnaldum muscled his way through the French defence, only to drag his shot wide. A minute later they were level as former Liverpool winger Babel beat Benjamin Pavard to right-back Kenny Tete’s cross. But it was Chelsea forward Giroud who settled the game, moving swiftly ahead of Netherlands captain Virgil van Dijk to meet substitute Benjamin Mendy’s cross and score his first goal in 11 internationals. The Netherlands host Germany on Saturday (19:45 BST), before the Germans travel to face France on Tuesday, 16 October (19:45 BST). Match ends, France 2, Netherlands 1. Second Half ends, France 2, Netherlands 1. Alphonse Areola (France) wins a free kick in the defensive half. Foul by Luuk de Jong (Netherlands). Substitution, Netherlands. Luuk de Jong replaces Ryan Babel. Attempt saved. Ruud Vormer (Netherlands) right footed shot from the centre of the box is saved in the centre of the goal. Assisted by Frenkie de Jong with a through ball. Substitution, Netherlands. Daryl Janmaat replaces Kenny Tete. Substitution, France. Steven Nzonzi replaces Antoine Griezmann. Delay in match Ryan Babel (Netherlands) because of an injury. Benjamin Pavard (France) is shown the yellow card. Ryan Babel (Netherlands) wins a free kick in the defensive half. Attempt missed. Memphis Depay (Netherlands) right footed shot from more than 35 yards is just a bit too high. Assisted by Georginio Wijnaldum. Attempt blocked. Kylian Mbappé (France) right footed shot from the right side of the box is blocked. Assisted by Paul Pogba. Substitution, Netherlands. Ruud Vormer replaces Quincy Promes. Goal! France 2, Netherlands 1. Olivier Giroud (France) left footed shot from the centre of the box to the bottom right corner. Assisted by Benjamin Mendy with a cross. Corner, France. Conceded by Ryan Babel. Quincy Promes (Netherlands) wins a free kick in the defensive half. Attempt missed. Memphis Depay (Netherlands) right footed shot from the right side of the box is close, but misses to the right. Assisted by Georginio Wijnaldum. Goal! France 1, Netherlands 1. Ryan Babel (Netherlands) left footed shot from the centre of the box to the bottom right corner. Assisted by Kenny Tete with a cross. Attempt missed. Georginio Wijnaldum (Netherlands) right footed shot from the right side of the six yard box misses to the left. Substitution, France. Benjamin Mendy replaces Lucas Hernández. Attempt missed. Antoine Griezmann (France) left footed shot from outside the box misses to the right. Assisted by Lucas Hernández. Attempt blocked. Olivier Giroud (France) header from the centre of the box is blocked. Assisted by Benjamin Pavard with a cross. Antoine Griezmann (France) is shown the yellow card for a bad foul. Corner, Netherlands. Conceded by Raphael Varane. Blaise Matuidi (France) wins a free kick in the defensive half. Foul by Kenny Tete (Netherlands). Attempt missed. Kylian Mbappé (France) right footed shot from outside the box is too high. Assisted by Benjamin Pavard. Offside, France. N’Golo Kanté tries a through ball, but Kylian Mbappé is caught offside. Second Half begins France 1, Netherlands 0. First Half ends, France 1, Netherlands 0. Kylian Mbappé (France) wins a free kick on the right wing.